Maruta Ninnaya is the only Suladhi (or Suladi) that Raghavendra Swamy composed and it is on Maruti or Hanuman. 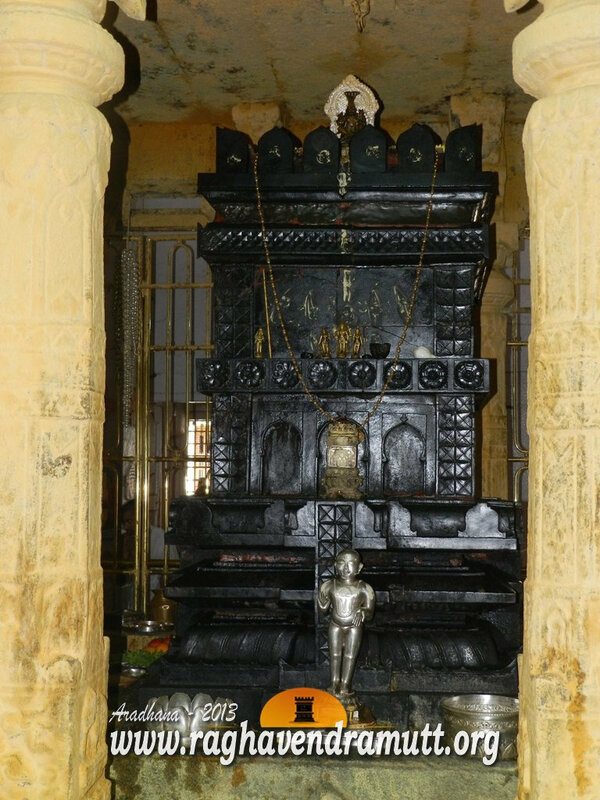 Hence, Raghavendra Swamy or Rayaru named it as Maruta Ninnaya Mahime. This is a much lesser known song than Indu Ennage Govinda. Rayaru composed Indu Enage Govinda when he visited Udupi after he was given Sanyas. Similarly, he composed Maruta Ninnaya Mahime. Thus, these are the only two songs he composed in Kannada. In Maruta, the invocation is to Sri Hari and it is vehicle to invoke the blessings of Hari Vayu to touch down on the final destination-the abode of Hari-the supreme God. was first published in Parimala magazine in 1955 and in Tatawada Manjari in its 1983 edition. This too Kannada means sulabhada hAdi – an easy route to invoke the blessings of Shri Hari-Vayu-Guru’s and to reach Shri Hari’s abode. This suladhi was an inspiration to scores of Haridasas as was Indu Enage Govinda. Almost all the Haridasas came to Mantralaya and offered their compositions to Rayaru. Raghavendra was instrumental in sparking the second revival of the Haridasa movement. Many Dasas from Raichur, Bijapur and surrounding areas surrendered to Raghavendra Swamy and begam composing songs in favour of Hari. Vijaya Dasa (1682-1755) was one of the foremost devotees of Rayaru and he composed scores of compositions on the Mantralaya seer. He also became an expert in composing suladis, so much so that he came to be called Suladi Dasaru. Generally, Suladis are used by the Haridasas to preach the basic features of Tatwavada and the five0-fold fifference as enunciated by Madhwacharya, including the concept of Taratamya. The Suladhi soon acquired so much holiness that the Haridasas felt that singing one suladi is equivalent to singing 100 devaru namas. By the way, the suladi is yet another combination of music and poetry fused harmoniously as an incantation to God. Suladis are lengthier compositions set to specific ragas and talas. Usually, a Suladi will have a single raga but seven different talas in succeeding parts. In a few suladis, there is a variation in raga too but such compositions are fare and few as composers have to acquire mastery over music to render them properly. Unlike many compositions of Purandara Dasa, suladis have themes that are bases in myths, religion and the spiritual. They have deep philosophical and ethical overtones. This is not to say Ourandara Dasa did not compose suladis. He has to his credit Navavidha Bhakti Prasamsa. Coincidentally, Annamacharya, the great Telugu saint of the 15th century and a contemporaty of Purandara Dasa, composed a solitary suladi in Telugu. This suladi begins in Mayamalava Gaula raga and ends with Sriraaga. Several Madhwa saints and Haridasas such as Narahari Theertha, Sripadaraya, Vyasaraya, Vadiraja, Kanakadasa, Gopaladasa, Jagannnatha Dasa, Vadiraja have composed a number of Suladis. Though Narahari Theertha was the first Madhwa saint to composed suladis, they were in Sanskrit. It was Sripadaraja of Mulabagal who showed that Suladis could be written in Kannada too. It was he who imbibed in his disciple, Vyasaraja, the love of music. In Vyasaraja;s next avatar as Raghavendra Swamy, this music lessons stood him in good stead and he composed Indu Enage and Maruta Ninna, both in Kannada.